Editor's Note: Inclusion of Nazi daggers in Sword-Site's collection does not imply approval of Nazi doctrine. Note also that it is often said that pattern welding was lost to mankind until after the middle of the 20th Century. Here exists proof that pattern welding was alive and well in the first half of the 20th century, and numerous other examples from Nazi Germany exist. 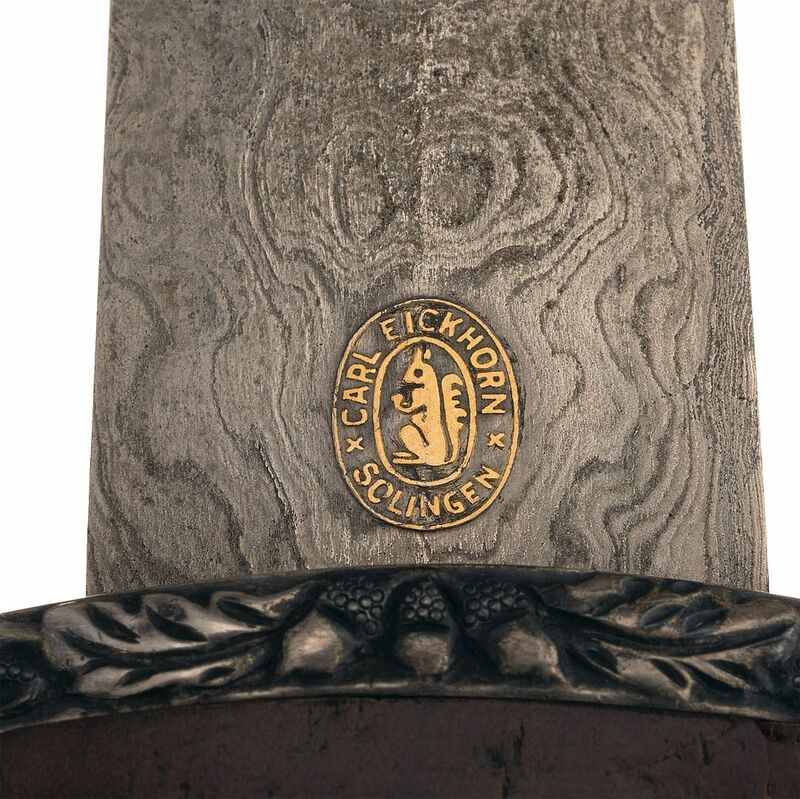 Introduced by Viktor Lutze, Ernst Rohm's successor as Chief of the SA, the High Leader Dagger bore many similarities to the honor daggers issued by Rohm before his death, being a special award granted personally by the Chief, but differs in being only intended for High SA Leaders, while Rohm's dagger was given to all ranks. 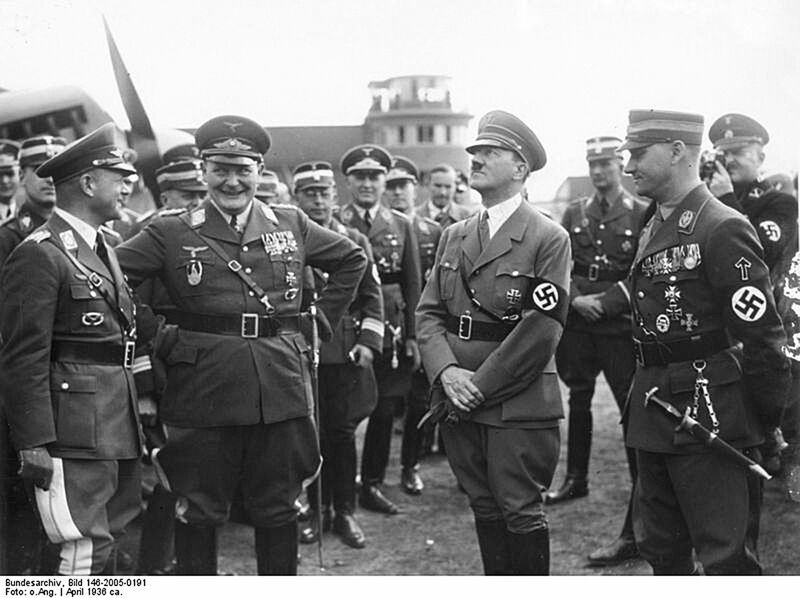 A veteran of World War I, Lutze joined the Nazi Party in 1922 and became one of the early members of the SA. In 1933 he was a major participant in the Night of Long Knives, specifically providing the list of SA men to be targeted for elimination by the SS. 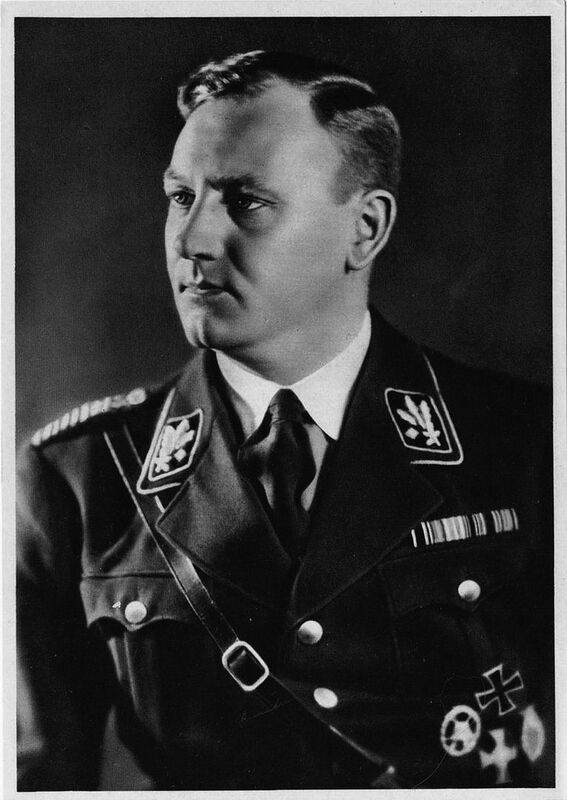 Taking command in the aftermath, Lutze was the leader of an organization in decline, as the same events that secured his promotion also marked the ascendency of the SS to the chief paramilitary organization in Nazi Germany. This particular example is fitted with a scarce Eickhorn production Damascus blade; while Damascus patterns could be faked in a mass production setting, true Damascus is a purely hand-made item, with only a limited number of smiths committed to the art. 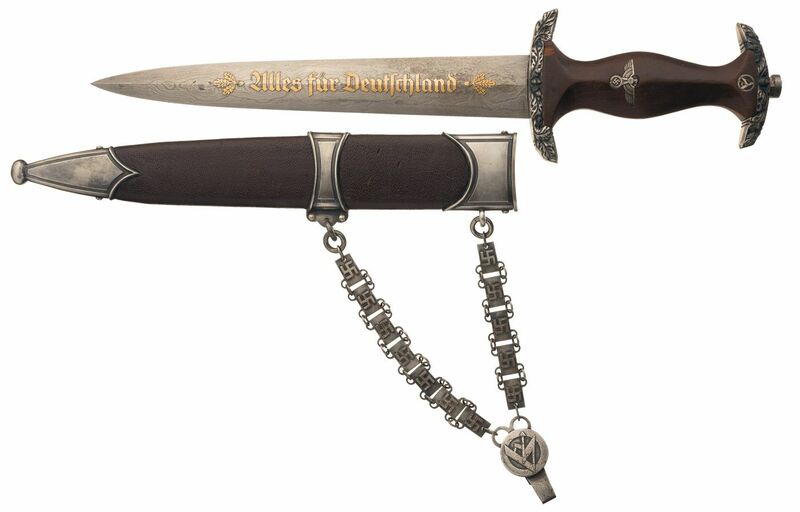 Measuring 13 1/2 inches long, the 8 1/2 inch blade has the traditional SA marking "Alles fur Deutschland" (Everything for Germany) in raised gold finished lettering flanked by oak leaf and acorn designs, with a raised gold highlighted Eickhorn logo on the reverse. The grip is a regulation standard brown hardwood with Nazi Eagle and SA Rune badges, set between a silver finished and deeply oak leaf and acorn engraved guard and matching pommel. The sheath has a simulated brown leather covering with silver finished throat, suspension band and tip, and a chain hanger with swastikas on the links (5 links front, 7 back) and the SA Runes on the suspension clip. The blade is excellent, with a few minor spots and handling marks, with over 95% of the original gold on the raised portions. The grip is fair, with a small chip and a crack visible on the obverse near the guard and a smaller crack on the reverse. The guard and pommel are both excellent, with a small amount of spotting on the pommel nut, a well aged patina in the lower areas, and sharp details. The sheath is very good, with some spotting on the chain, a few dings on the sheath body, and a well aged silver patina. It is unknown what member of the SA was meant to receive this dagger, but the quality of the features suggests an important and well-respected recipient. One of the rarest Nazi paramilitary daggers, combined with a scarce and desirable German Damascus blade.